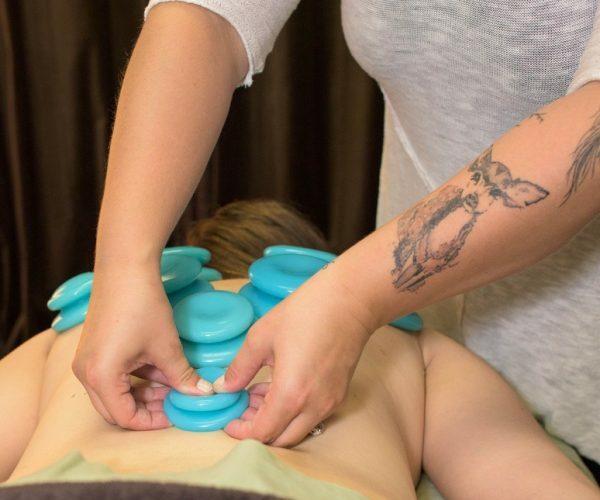 By creating suction and negative pressure, Massage Cupping Therapy is used to soften tight muscles, loosen adhesions, and separate layers of connective tissue to bring hydration and blood flow to body tissues. Massage cupping bodywork is versatile and can easily be modified to accomplish a range of techniques, from facilitation of lymphatic drainage to deep-tissue myofacial release.Massage Cupping is very relaxing, effective, and a time honored technique dating back thousands of years. Suction pulls toxins, pathogenic factors, blood poison, dead lymph and cellular debris from deep within tissues to the skin. These toxic agents are then more easily expelled from the body with the use of massage cupping. The marks dissipate from a few hours to several weeks, depending on the amount of stagnation and post treatment activities. Massage Cupping marks are an indication of existing disease and toxins being removed from deep within the tissues. If there is no restriction, pathogen, blockage in lymph or blood circulation, marks will appear light pink, which indicates normal healthy blood flow to the dermis and disappear within a few minutes after the treatment. Usually, the greatest amount of deposits being drawn to the surface will occur in the first few treatments- this is a good thing. The marks will lessen in intensity as the deeper issues are resolved and stagnations and toxins are processed out of the body via the circulatory and lymphatic systems. Although the marks look painful, they are not. Clients usually feel an immediate sense of relief. Many of our Practitioner's hold a basic certification in Massage Cupping. For more information check out the FAQ's below or read the Bio Page's of a Practitioner to see if they are Certified. Why should I try Massage Cupping? Sometimes areas of tension or injury are simply too tense or tender to treat with certain therapeutic methods such as deep tissue massage, trigger point therapy or cross-fiber friction. Massage cupping is a gentle, non-invasive way to soften broad areas of tension so that more specific massage techniques can be comfortably applied. Massage cupping is especially effective for tightness of the iliotibial (IT) band, piriformis syndrome, digestive disorders, menstrual problems, carpal tunnel, tight hamstrings, chronic pain, tightness, and general muscle tightness. Some people are contraindicated from Massage Cupping. If you have a medical condition please do not hesitate to ask if you are able to receive this Modality. What can I expect in a general session? There are two main uses of cupping: stationary and in massage. Stationary cupping is used in TCM to clear stagnation of blood; to facilitate the release of pathogenic factors; and to dispel internal heat. Cups are placed on the skin and left for five to 20 minutes. Depending on the area of cupping needed anywhere from 4 to 12 cups may be applied and then removed cyclically in a technique called flash cupping or cups will be glided through out the body. Depending on your needs; both techniques may be used in 1 session. Both methods are commonly used for treating lung congestion and for removing heat from the body. Stationary cupping sometimes results in rings and circles on the back as toxins and blood moves to the surface. How does cupping feel? Is it painful? Cupping clients usually report lasting changes for the better (especially with cumulative treatments). Cupping has a sedating effect on the nervous system, and many people find it profoundly relaxing. After a cupping treatment, clients typically report feelings of relief, muscular release, lightness, pleasant tingling, and freedom from pain and an increase in flexibility and muscular control. Contracted, tense and painful muscle tissue will soften quickly with just a few minutes of massage cupping. Cupping is generally not painful. Some people who suffer from fibromyalgia or other chronic muscular disorders may feel minimal discomfort and should mention it immediately so adjustments can be made. Many people report that muscle tension and tenderness that was there prior to the session continues to improve for many hours after the session is completed and experience lasting results vs receiving a general massage. In areas of tissue dysfunction, this technique may occasionally leave a temporary mark, called "sha." Sha resembles a bruise but is not painful. Traditional Chinese Medicine regards the appearance of sha as an indication that toxins and stagnation are being pulled to the surface of the body restoring healthy qi and blood flow below. These are NOT bruises. Bruises are usually the result of trauma from impact that breaks blood vessels allowing blood to seep into the surrounding tissue. In contrast, cupping involves the application of suction. Once understood and the many positive results of cupping are experienced, any initial concerns about cupping discolorations disappear. How long do the marks last? If any discolorations surface these are temporary, typically ranging in color from light pink to dark purple and can last anywhere between a few hours to 10 days before gradually fading away entirely. Again, no pain or tenderness is typically felt following a cupping treatment, whether or not discolorations appear on the skin. What do the marks indicate? Traditional Chinese Medicine learning indicate that the marks result from dredging stagnation from within bodily tissues up closer to the surface of the skin, also helping to restore flow of energy and blood to the areas treated. This stagnation can include dead blood cells, old lymph fluid, and toxins that the body has not been able to eliminate via its circulatory system. You will probably feel different already after the first treatment, but for lasting changes you would need to have a series of sessions over weeks or months. 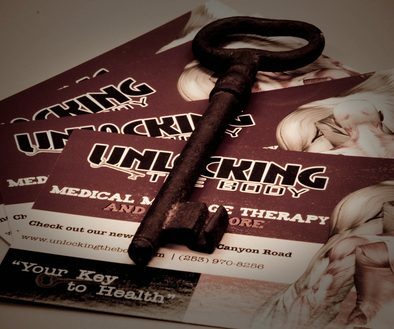 Your Practitioner will discuss your specific plan with you at the end of your first session.